Robert Broner introduced many printing techniques central to the growth of twentieth century fine art graphics. In a New York one-man-show in 1955, he exhibited an original development of the monotype, the Texture Imprint. Broner was one of the first to print from found electric circuits when circuit boards were still in their infancy. He also printed from metal collages, and used various photo processes combined with Xeroxed images. More recently, the artist began a series of exceptionally large wood collage prints. 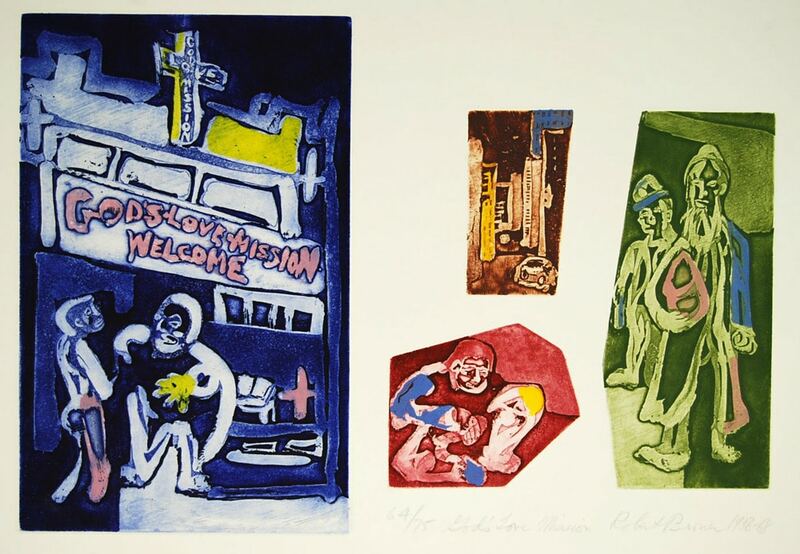 A Life in Print: A Retrospective Exhibition; Five Decades of Works by Renowned Printmaker and Teacher of Generations of Artists, Hebrew Union College. Education: Wayne State University, Detroit, 1944 B.FA., 1945 MFA; Society of Arts and Crafts, Detroit 1942-45;University of California at Los Angles, 1946-47; Atelier 17, with S.A, Hayter, 1949-51;Stuart Davis at the New School for Social Research 1944-50. Exhibitions : extensive group and solo exhibitions since 1951. An extensive retrospective catalogue of his work is contained in the Hebrew Union College publication. Collections: Metropolitan Museum of Art NY, Museum of Modern Art NY; Brooklyn Museum, Brooklyn, NY; New York Public Library, NY; Guggenheim Museum NY; Israel Museum, Jerusalem, Israel; the Art Institute of Chicago, IL; Cincinnati Museum, OH; Detroit Institute of Arts, MI; Los Angeles County Museum, CA; National Gallery, Washington, D. C.; the Smithsonian Institution, Washington, D.C., and many other public and private collections. In addition to creating art, Broner has been an art critic and correspondents for, Art in America, Craft Horizons, Art News, and New Art Examiner. He founded Print News a journal for printmakers. He is a past president of the Society of American Graphic Artists.